Cast steels are generally classified into the categories of (i) carbon (C) steels, (ii) low alloy steels, (iii) corrosion resistant steels, and (iv) heat resistant steels, depending on the alloy content and the planned usage. Steel castings are categorized as corrosion resistant if they are capable of sustained operation when exposed to attack by corrosive agents at operating temperatures which are generally below 300 deg C.
The high alloy iron base compositions are generally given the name ‘stainless steels’, though this name is not recognized universally. Actually, these steels are widely referred to as cast stainless steels. Some of the high alloy steels (e.g. 12 % chromium steel) show many of the familiar physical characteristics of C steels and low alloy steels, and some of their mechanical properties, such as hardness and tensile strength (TS), can be altered by suitable heat treatment. The alloy steels of higher chromium (Cr) content (20 % to 30 % Cr), Cr-Ni (nickel) steels and Ni-Cr steels do not show the changes in phase observed in ordinary C steel when heated or cooled in the range from room temperature to the melting point. Consequently, these steels are non hardenable, and their mechanical properties depend on the composition instead of heat treatment. The high alloy steels (stainless steels) differ from C steels and low alloy steels in other respects, such as their production and properties. Special attention is required to be given to each grade with regard to casting design and casting practice in the foundry. For example, such elements as Cr, Ni, C, N2 (nitrogen), Si (silicon), Mo (molybdenum), and Nb (niobium) can exert a deep impact on the ultimate structure of these complex steels. Hence, balancing of the alloy compositions is normally required to get an acceptable product. The chemical ranges used in the production of wrought stainless steels are not used in the production of castings, since a different balance of alloying elements is generally required to provide castability, necessary mechanical properties, and optimum corrosion resistance. Corrosion resistance is a relative term which depends on the specific atmospheric conditions to which particular cast steel is exposed. Carbon and low alloy steels are considered resistant only to very mild corrosive atmospheres, but the various high alloy cast steel grades are applicable for different situations varying from mild atmospheres to severe atmospheres, depending on the specific conditions involved. It is often misleading to list the comparative corrosion rates of different cast alloy steels exposed to the same corroding atmosphere. Cast alloy steels are to be carefully selected for the purpose of corrosion resistance for a specific application. The aspects which are required to be considered for the selection of steel include (i) the main corrosive agents and their concentrations, (ii) known or suspected impurities, including abrasive materials and their concentration, (iii) average operating temperature, including variations even if encountered only for short periods, (iv) presence (or absence) of O2 (oxygen) or other gases in solution, (v) intermittent or continuous operation, and (vi) fluid velocity. Each of these aspects can have an important effect on the service life of both cast and wrought equipment, and such detailed information normally is necessary during the selection of steel. Many accelerated failures are traceable to these aspects which have been overlooked. Selection of the most cost effective cast steel is frequently being made by the careful use of the corrosion data. However, discretion is needed in evaluating the relative corrosion rates of various cast steels since there are the uncertainties of the actual test or service conditions. Corrosion rates determined in controlled laboratory tests are to be used cautiously when considering actual use. The information available from the equipment used under similar operating conditions can be considered more accurate. However, exposing samples to service conditions can also provide valuable information. Unless protected by a protective coating, cast steels like any other iron and steel materials corrode in the presence of O2 and water. Hence, cast steels corrode when it is exposed to moist air. The rate at which corrosion continues in the atmosphere depends on the corroding medium, the conditions of the particular location in which the steel is in use, and the precautions which have been taken to prevent corrosion. The rate of corrosion also depends on the quality of the cast steel as determined by its chemical composition and heat treatment. The likely rate of corrosion of the cast steel in an atmosphere can normally be estimated only from tests carried out for a long time. Cast steels and wrought steels of similar analysis and heat treatment show about the same corrosion resistance in the same atmospheres. Plain C steels and some of the low alloy steels do not generally resist severe corrosive conditions, although there are some exceptions, such as strong sulphuric (HaSO4) acid. For increasing the corrosion resistance of cast steel substantially, it is essential to use extensive alloying of the cast steel. Small amounts of Ni and copper (Cu) slightly increase the corrosion resistance of the steel to the atmospheric attack. However, substantially larger amounts of other elements, such as Cr or Ni improve resistance considerably. In case of atmospheric corrosion, tests carried out to compare the corrosion resistance of several cast steel samples in industrial and marine atmospheres at many places with surfaces of half the specimens machined have shown that the conditions of the sample surface have no significant effect on the corrosion resistance of cast steels. Unmachined surfaces with the casting skin intact have shown corrosion rates similar to those of the machined surfaces regardless of the atmospheric conditions. The maximum corrosion rates have been noticed in the marine atmosphere around 25 m above the ocean surface, with lower but similar corrosion rates occurring in the industrial atmosphere and the marine atmosphere around 250 m above the ocean surface. The corrosion rate of cast steels decreases as a function of time, since corrosion products (scale coating) build up and act as a protective coating on the cast steel surface. However, the corrosion rate of the many corrosion resistant cast steels (with 2 % Ni) is always less than that of lesser corrosion resistant cast steels. Cast steels containing small percentages of Ni, Cu, or Cr as alloying elements have better corrosion resistance than that of cast C steels and those containing Mn when exposed to atmospheric conditions. Increasing the Ni and the Cr contents of cast steel increases the corrosion resistance in all the atmospheric conditions mentioned above. All cast steels have better corrosion resistance than malleable cast iron in industrial atmospheres and are superior or equivalent to the wrought steels in these atmospheric conditions. The corrosion rate in the marine atmosphere depends mainly on the alloy content of the cast steel. The corrosion resistance of cast C steel is much superior to that of similar wrought steel, but is slightly inferior to malleable cast iron. Corrosion studies done for several low alloy cast steels and high alloy cast steels in other atmospheric conditions (high temperature steam at 650 deg C, petroleum products atmosphere) have shown that the corrosion resistance of cast steels improves as the content of Cr increases in the cast steels. The main alloying element in the high alloy family of cast stainless steels is generally Cr, which, through the formation of protective oxide films, is the first step for these cast steels in achieving stainless quality. For all practical purposes, stainless behaviour requires a minimum of 12 % Cr. Corrosion resistance of cast stainless steels further improves with additions of Cr to at least the 30 % level. Ni and smaller amounts of Mo (molybdenum) and other elements are frequently added to the Fe-Cr (iron-chromium) matrix in these steels. Although Cr is the ferrite and martensite promoter, Ni is an austenite promoter. By varying the amounts and ratios of these two elements (or their equivalents), almost any desired combination of microstructure, strength, or other property can be achieved. Equally important is heat treatment. Temperature, time at temperature, and cooling rate are to be controlled to get the desired results. It is useful to think of the compositions of cast stainless steels in terms of the balance between ferrite promoters and austenite promoters. This is done on the widely used Schaeffler-type diagrams (Fig 1). The phases shown are those that persist after cooling to room temperature at rates normally used in fabrication. The empirical correlations shown in Fig 1 can be understood from the following. 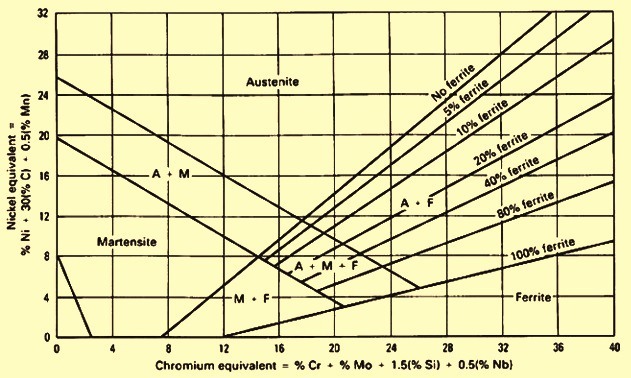 The field designated as martensite encompasses such cast stainless steels which contain 12 % to 17 % Cr, with adequate Ni, Mo, and C to promote high hardenability, that is, the ability to transform completely to martensite when cooled at even the moderate rates associated with the air cooling of heavy sections. Cast stainless steels since they are highly alloyed, have low thermal conductivities and cool slowly. To achieve the desired properties, a full heat treatment is needed after casting. This means that the casting is austenitized by heating to around 880 deg C to 970 deg C, cooled to room temperature to produce the hard martensite, and then tempered at around 600 deg C to 750 deg C until the desired combination of strength, toughness, ductility, and resistance to corrosion or stress corrosion is achieved. Increasing the Ni equivalent (moving vertically in Fig 1) ultimately results in a cast stainless steel which is fully austenitic. These steels are very ductile, tough, and corrosion resistant. On the other hand, the yield strength (YS) and tensile strength (TS) may be comparatively low for the fully austenitic cast stainless steels. Since these high Ni stainless steels are fully austenitic, they are nonmagnetic. Heat treatment consists of a single step which consists of water quenching from a relatively high temperature at which carbides have been taken into solution. Solution treatment can also homogenize the structure, but since no transformation occurs, there can be no grain refinement. The solutionizing step and rapid cooling ensure maximum resistance to corrosion. Temperatures between around 1050 deg C and 1200 deg C are generally needed. Adding Cr to the lean cast stainless steels (proceeding horizontally in Fig 1) stabilizes the ferrite which forms when the casting solidifies. With high Cr content, these cast stainless steels have relatively good resistance to corrosion, especially in S (sulphur) bearing atmospheres. However, being single phase, they are non hardenable and have poor toughness. Between the fields designated M, A, and F in Fig 1 are regions indicating the possibility of two or more phases in the cast stainless steels. Commercially, the most important of these steels are the ones in which austenite and ferrite coexists. . These steels generally contain 3 % to 30 % ferrite in a matrix of austenite. Predicting and controlling ferrite content is important for the successful application of these steels. Duplex type steels offer superior strength, weldability, and corrosion resistance. Strength, for example, increases directly with ferrite content. Achieving specified minimums can necessitate controlling the ferrite within narrow bands. Schoefer’s equations (Fig 2) are used for this purpose. These duplex stainless steels are to be solution treated and rapidly cooled before use to ensure maximum resistance to corrosion. The presence of ferrite is not entirely beneficial. Ferrite tends to reduce toughness, although this is not of great alarm because of the extremely high toughness of the austenite matrix. However, in uses which require exposure to higher temperatures, usually 320 deg C and above, the metallurgical changes associated with the ferrite can be severe and detrimental. In the low end of this temperature range, the reductions in toughness seen have been due to the carbide precipitation or reactions associated with 475 deg C embrittlement. The 475 deg C embrittlement is caused by precipitation of an intermetallic phase with a composition of around 80Cr-20Fe. The name is derived from the fact that this embrittlement is very severe and rapid when it occurs at around 475 deg C. At around 550 deg C and above, the ferrite phase can transform to a complex Fe-Cr-Ni-Mo intermetallic compound known as phase, which reduces toughness, corrosion resistance, and creep ductility. The amount of the reduction increases with time and temperature to around 820 deg C and can persist to 920 deg C. In extreme cases, Charpy V-notch energy at room temperature can be reduced 95 % from its initial value. The heat resistant cast stainless steels are to have properties so as to withstand temperatures above 1100 deg C in the most severe high temperature applications. An important factor concerning the corrosion behaviour of these steels is the Cr content. Chromium imparts resistance to oxidation and sulphidation at high temperatures by forming a passive oxide film. Heat resistant cast stainless steels are also to have good resistance to carburization. Resistance to oxidation increases directly with Cr content. For very severe operating conditions at temperatures higher than 1100 deg C, chromium content of 25 % or more is needed. Additions of Ni, Si, Mn and Al (aluminum) promote the formation of relatively impermeable oxide films that impede further scaling. Thermal cycling is extremely damaging to oxidation resistance because it leads to breaking, cracking, or spalling of the protective oxide film. The best performance is achieved with austenitic cast stainless steels containing 40 % to 50 % combined Ni and Cr. Sulphidation atmospheres are becoming increasingly important. Petroleum processing, coal conversion, utility and chemical applications, and waste incineration have increased the need for cast stainless steels resistant to sulphidation attack in relatively weak oxidizing or reducing atmospheres. Luckily, high Cr and Si contents increase resistance to S bearing atmospheres. On the other hand, Ni has been found to be detrimental to the most aggressive gases. The problem is attributable to the formation of low melting Ni-S eutectics. These produce highly destructive liquid phases at temperatures even below 810 deg C. Once formed, the liquid can run onto adjacent surfaces and rapidly corrode other metals. Cast stainless steels are frequently used in non-oxidizing atmospheres in which C diffusion into metal surfaces is possible (carburizing of steel). Depending on Cr content, temperature, and carburizing potential, the surface of steel can become very rich in Cr carbides, rendering it hard and possibly susceptible to cracking. Si and Ni are believed to be beneficial and enhance resistance to carburization. The cast stainless steels for liquid corrosion application are required to resist corrosion in the different atmospheres in which they are regularly used. General principles and important highlights of the corrosion behaviour of these steels as influenced by the metallurgy of these steels include general corrosion, inter-granular corrosion, localized corrosion, corrosion fatigue, and stress corrosion. Martensitic cast stainless steels are normally used in applications requiring high strength and some corrosion resistance. Some of these steels typically show a microstructure of martensite and ferrite. These steels contain the minimum amount of Cr (11 % to 14 %) to be considered stainless steel and as such cannot be used in aggressive atmospheres. However, these steels show good atmospheric corrosion resistance, and it resists staining by many organic atmospheres. Some other of these steels can contain slightly more Mo (up to 1 %) and hence have improved general corrosion resistance in relatively mild atmospheres. In case these steels contain more Ni and Mo, then their general corrosion resistance improves. In case these steels have a lower C then the lower strength level promotes resistance to sulphide stress cracking (SSC). In case these steels have higher strength then they also shows good atmospheric-corrosion resistance after a heat treatment consisting of normalizing and tempering. Micro-structurally, some of these steels generally consist of mixed martensite and ferrite. Because of the increased Cr and Ni levels compared to the other martensitic stainless steels, they offer improved corrosion resistance to seawater and some mild acids. These steels are also hardenable and offer the possibility of increased strength and improved corrosion resistance among the martensitic stainless steels. Ferritic cast stainless steels have higher C and higher Cr than the martensitic cast stainless steels. These steels are mostly ferritic, although a small amount of martensite can be present in some of the steels (containing 18 % to 21% Cr) which are used in chemical processing and oil refining applications. The Cr content is sufficient to have good corrosion resistance to many acids, including nitric (HNO3) acid. Some of these steels contain considerably more Cr (26 % to 30 %) and offers comparatively high resistance to localized corrosion and high resistance to many acids, including dilute H2SO4 acid and such oxidizing acids as HNO3 acid. Austenitic cast stainless steel typically containing around 19 % Cr and 9 % Ni can more frequently contain some residual ferrite (3 % to 30 %) in an austenite matrix. In the solution-treated condition, this steel has excellent resistance to a wide variety of acids. It is particularly resistant to highly oxidizing acids, such as boiling HNO3 acid. The duplex nature of the microstructure of this steel imparts additional resistance to stress corrosion cracking (SCC) compared to its wholly austenitic counterparts. This steel with a reduced C has essentially identical corrosion resistance except that steel with lower C is much less susceptible to sensitization. For uses in which the corrosion resistance of the weld heat affected zone (HAZ) is critical, steel with lower C is generally used. Some of these steels contain more ferrite than the steels discussed above. Since the higher ferrite content is achieved by increasing the Cr/Ni equivalent ratio, the steels can have slightly higher Cr or slightly lower Ni contents than the low ferrite equivalents. In general, the corrosion resistance is very similar, but the strength increases with ferrite content. Because of the high ferrite content, their use is to be restricted to temperature below 400 deg C due to the possibility of severe embrittlement. The Nb stabilized grade of this steel contains small amounts of Nb, which tend to form carbides preferentially over Cr carbides and improve inter-granular corrosion resistance in applications involving relatively higher temperatures. Cast austenitic stainless steels which are Mo bearing (2 % to 3 %) have resistance to many chloride bearing atmospheres. The presence of around 2 % to 3% of Mo also improves crevice corrosion and pitting resistance compared to the steels with no Mo content. Mo bearing steels are normally not as resistant to highly oxidizing atmospheres (this is mainly true for boiling HNO3 acid), but for weakly oxidizing and reducing atmospheres, Mo bearing steels are normally superior. Selenium (Se) bearing cast stainless steel is a free machining grade of cast stainless steel. Since this steel normally contains 19 % Cr and 10 % Ni, it has adequate corrosion resistance to a wide range of corrodents, but the large number of selenide inclusions makes surface deterioration and pitting definite possibilities. Cast stainless steel containing around 19 % to 20 % Cr is a fully austenitic, relatively high strength corrosion-resistant steel. The Cr content of 19 % to 20 % provides resistance to many types of oxidizing acids, but the high C content makes it imperative that this steel is utilized in the solution treated condition for atmospheres known to cause inter-granular corrosion. 27Cr-9Ni cast stainless steel normally contains around 10 % to 20 % ferrite in an austenite matrix. The high C and ferrite contents provide relatively high strength. The high Cr content and duplex structure act to minimize corrosion because of the formation of Cr carbides in the microstructure. This particular steel is known for good resistance to sulphurous (H2SO3) acid and H2SO4 acid, and it is extensively used in the pulp and paper industry. Cast stainless steel containing around 19 % to 20 % Cr with a Mo content of 3 % to 4 % is slightly more highly alloyed because of increased Mo content. The increased amount of Mo provides better corrosion resistance to halide bearing media and reducing acids, particularly H2SO3 acid and H2SO4 acid solutions. However, the high Mo content renders the steel generally unsuitable in highly oxidizing atmospheres. Cast stainless steel with a nominal composition of Fe-26Cr-5Ni-2Mo-3Cu is highly alloyed steel. The Cr/Ni equivalent ratio for this steel is quite high, and a microstructure containing approximately equal amounts of ferrite and austenite is common. The low C content and high Cr content make the steel comparatively immune to inter-granular corrosion. High Cr and Mo provide a high degree of localized corrosion resistance (crevices and pitting), and the duplex microstructure provides SCC resistance in many atmospheres. This steel can be precipitation hardened to provide strength and is also relatively resistant to abrasion and erosion-corrosion. Cast stainless steels containing around 22 % to 26 % Cr and 12 % to 15 % Ni are fully austenitic. The high Cr content minimizes the tendency toward the formation of Cr depleted zones due to sensitization. These steels are used for handling paper pulp solutions and are known for good resistance to dilute H2SO4 acid and HNO3 acid. Cast stainless steels containing around 23 % to 27 % Cr and 19 % to 22 % Ni and is less susceptible than the steel containing 22 % to 26 % Cr and 12 % to 15 % Ni to inter-granular corrosion attack in many acids after brief exposures to the Cr carbide formation temperature range. Maximum corrosion resistance is achieved by solution treatment. This steel possesses good corrosion resistance to many acids and, because of its fully austenitic structure, can be used at relatively high temperature. Cast stainless steel with a normal composition of Fe-29Ni-20Cr-2.5Mo-3.5Cu, shows good corrosion resistance in a wide variety of atmospheres and is frequently used for H2SO4 acid application. Relatively high resistance to inter-granular corrosion and SCC make this steel attractive for very many applications. Although relatively highly alloyed, the fully austenitic structure of this steel can lead to SCC susceptibility for some atmospheres and stress states. The optimum corrosion resistance for austenitic and duplex cast stainless steels is developed by solution treatment. Depending on the specific steel used, temperatures between 1050 deg C and 1200 deg C are needed for ensuring complete solution of all carbides and phases, such as and , the sometimes form in highly alloyed stainless steels. Cast stainless steels containing relatively high total alloy content, particularly high Mo content, often require the higher solution treatment temperature. Water quenching from the temperature range of 1050 deg C to 1200 deg C generally completes the solution treatment. Failure to solution treat a particular steel or an improper solution treatment can seriously compromise the observed corrosion resistance in service. Inadvertent or unavoidable heat treatment in the temperature range of 500 deg C to 800 deg C (e.g. welding) can destroy the inter-granular corrosion resistance of the steel. When austenitic or duplex (ferrite in austenite matrix) cast stainless steels are heated in or cooled slowly through this temperature range, Cr rich carbides form at grain boundaries in austenitic cast stainless steels and at ferrite/austenite interfaces in duplex cast stainless steels. These carbides deplete the surrounding matrix of Cr, thus reducing the corrosion resistance of the steel. Steel in this condition of reduced corrosion resistance due to the formation of Cr carbides is said to be sensitized. In small amounts, these carbides can lead to localized pitting in the steel, but if the Cr depleted zones are extensive throughout the steel or HAZ of a weld, the steel can disintegrate inter-granularly in some of the atmospheres. If solution treatment of the steel after casting and/or welding is impractical or not possible, there are several tools available to the operator from which he can choose to minimize potential inter-granular corrosion problems. The low C grades are normally used as a solution to the sensitization incurred during welding. The low C (0.03 % maximum) content of these steels prevents the formation of an extensive number of Cr carbides. In addition, these steels usually contain 3 % to 30 % ferrite in an austenitic matrix. By virtue of rapid carbide precipitation kinetics at ferrite/austenite interfaces compared to austenite/austenite interfaces, carbide precipitation is confined to ferrite/austenite boundaries in the steels containing a minimum of around 3 % to 5 % ferrite. If the ferrite network is discontinuous in the austenite matrix (depending on the amount, size, and distribution of ferrite pools), then extensive inter-granular corrosion is not a problem in many of the atmospheres to which these steels are likely to be used. These low C steels need not sacrifice significant strength compared to their high C counterparts, because N2 (nitrogen) can be added to increase strength. However, a large amount of N2 begins to reduce the ferrite content, which cancels some of the strength gained by interstitial hardening. Suitable adjustment of the Cr/Ni equivalent ratio is beneficial in such cases. Luckily, N2 is also beneficial to the corrosion resistance of austenitic and duplex stainless steels. N2 seems to retard sensitization and improve the resistance to pitting and crevice corrosion of many cast stainless steels. The standard practices as described in relevant standards are usually implemented to predict and measure the susceptibility of austenitic and duplex stainless steels to inter-granular corrosion. The published data in literature indicate the superior resistance of the low C cast stainless steels to inter-granular corrosion. The data also indicates that for highly oxidizing atmospheres (represented usually by boiling HNO3 acid) the low C steels are equivalent in the solution treated condition but that subsequent heat treatment causes the corrosion resistance of the steels to deteriorate rapidly for application in oxidizing atmospheres. In addition, the degree of Cr depletion necessary to cause susceptibility to inter-granular corrosion appears to increase in the presence of Mo. The passive film stability imparted by Mo can offset the loss of solid-solution Cr for mild degrees of sensitization. Ferritic cast stainless steels can also be sensitized by the formation of extensive Cr carbide networks, but because of the high bulk Cr content and rapid diffusion rates of Cr in ferrite, the formation of carbides can be tolerated if the steel has been slowly cooled from a solutionizing temperature of 780 deg C to 900 deg C. The slow cooling allows replenishment of the Cr adjacent to carbides. Martensitic cast stainless steels generally do not contain sufficient bulk Cr and are to be used in applications in which inter-granular corrosion is likely to be of concern. Typical Cr contents for martensitic steels can be as low as 11 % to 12 %. In case of localized corrosion, austenitic and martensitic stainless steels show a tendency toward localized corrosion. The conditions conducive to this behaviour can be any situation in areas where flow is restricted and an O2 concentration cell can be established. Duplex steels have been found to be less susceptible. Localized corrosion is particularly acute in atmospheres containing chloride ions (Cl-) and in acidic solutions. Increasing the alloy content improves resistance to localized corrosion. Mo has long been recognized as effective in reducing localized corrosion, although it is not a total solution. N2 is also effective at retarding localized corrosion. It has been suggested that resistance to pitting is good when a crevice factor [% Cr + 3(%Mo) + 15(% N)] is higher than 35. 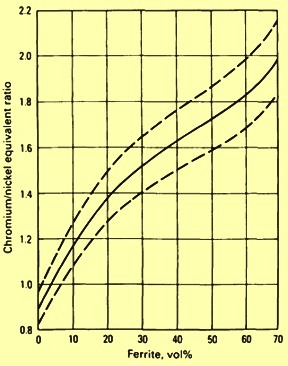 Another technique for comparing steel composition resistance to localized corrosion is to ascertain the critical crevice temperature (CCT). This involves determining the maximum temperature at which no crevice attack occurs during a 24 hour testing period. Although the CCT has been shown to correlate well with tests in aerated seawater, it is not to be used as the maximum operating temperature in seawater or other chloride containing media. The ferric chloride (FeCl3) test atmosphere is a very severe, highly oxidizing atmosphere containing around 39,000 ppm chloride ions at a pH value of around 1.4. Hence, the FeCl3 CCT is lower than that normally found in aerated seawater, which contains around 20,000 ppm of chloride ions with a pH value of around 7.5 to 8.0. Corrosion fatigue is one of the most destructive and unpredictable corrosion-related failure mechanisms. Behaviour is highly specific to the atmosphere and the steel. The martensitic steels are degraded the most in both absolute and relative terms. If left to corrode freely in seawater, they have very little resistance to corrosion fatigue. This is a remarkable in view of their very high strength and fatigue resistance in air. Properties can be protected if suitable cathodic protection is applied. However, since these steels are susceptible to H2 (hydrogen) embrittlement, cathodic protection is to be carefully applied. Too large a protective potential leads to disastrous H2 stress cracking. Austenitic steels are also severely degraded in corrosion fatigue strength under conditions conducive to pitting, such as in seawater. However, they are easily cathodically protected without fear of H2 embrittlement and perform well in fresh waters. There are no wide investigations for the corrosion fatigue behaviour of duplex steels. The stress corrosion cracking (SCC) of cast stainless steels has been studied for only a limited number of atmospheres, heat treatments, and test conditions. From the limited information available, the following generalized views can be made. SCC resistance seems to improve as the composition is adjusted to provide increasingly greater amounts of ferrite in an austenitic matrix. This trend continues to a certain level, apparently near 50 % ferrite. Lower Ni contents tend to improved SCC resistance in cast duplex stainless steels, possibly because of its effect on ferrite content. Ferrite appears to be involved in a keying action in discouraging SCC. At low and medium stress levels, the ferrite tends to block the propagation of stress corrosion cracks. This can be due to a change in composition and/or crystal structure across the austenite/ferrite boundary. As the stress level increases, crack propagation can change from austenite/ferrite boundaries to trans-granular propagation. Reducing the C content of cast stainless steels reduces the susceptibility to sensitization and improves SCC resistance. This is also true for wrought steels.